Health conscious food consumers have already known blueberries are high in antioxidants. But a new study found black rice has even higher levels of antioxidants called anthocyanins. The study presented at the 240th National Meeting of the American Chemical Society (ACS) showed that one spoonful of black rice bran contains more anthocyanin antioxidants than a spoonful of bluebberries and better yet, black rice offers more fiber and vitamin E antioxidants, but less sugar. Anthocyanin antioxidants have been linked with lower risk of heart disease, cancer and other western diseases, which are apparently associated with low intake of vegetables and high intake of sugar and meats in the West, according to previous studies. For instance, a review published in the March 2010 issue of Nutrition Review says anthocyanins and other nutrients like micronutrients and fiber found in berries including chokeberries, cranberries, blueberries and strawberries either in the form of fresh fruit, juice or freeze-fried fruits are associated with favorable cardiovascular risk profiles, meaning that they may lower risk of heart disease. Basu A and colleagues at Oklahoma State University in Stillwater, OK, say in their report that berries offer the cardiovascular benefits by upregulating endothelial nitric synthase, lowering activities of carbohydrate digestive enzymes, decreased oxidative stress and inhibiting expression of inflammatory genes among others. Zhimin Xu, Associate Professor at the Department of Food Science at Louisiana State University Agricultural Center in Baton Rouge, La. analyzed black rice and black rice bran produced in the Southern United States for the content of anthocyanin antioxidants. Lipid soluble antioxidants found in black rice contains higher amounts of water soluble anthocyanin antioxidants, the researchers found. In comparison, brown rice, which possesses only high amounts of oil-soluble gamma-tocotrienol and gamma-oryzanol antioxidants, which can help lower bad cholesterol. Black rice bran protects against chemically-induced inflammation at least in an animal model, according to a recent study in the Aug 23 2010 issue of Journal of Agricultural and Food and Chemistry. Choi S.P. and colleagues from Ajou University in Suwon, Korea tested black rice bran extract and extract of brown rice to see the extract may have a protective effect against inflammation on mouse skin. They found black rice bran extract, but not the brown rice bran extract, significantly suppressed 2,4-dinitrofluorobenzene-induced dermatitis on the skin of the study mice. 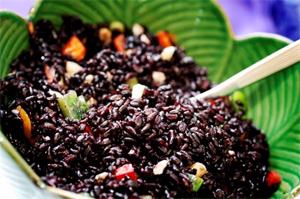 Black rice is commonly used for decorating of Chinese food like noodle and pudding. This crop may not be as cheap as some media outlets claim in the West though. Anthocyanin-rich foods include blackberry, blueberry, red grapes, red raspberries, strawberry, red wine, plum, red cabbage, red onion, and blood orange juice, according to the Linus Pauling Institute.